Murchinson Valley / Rutherford Pass • By madpom. Licence: cc by. 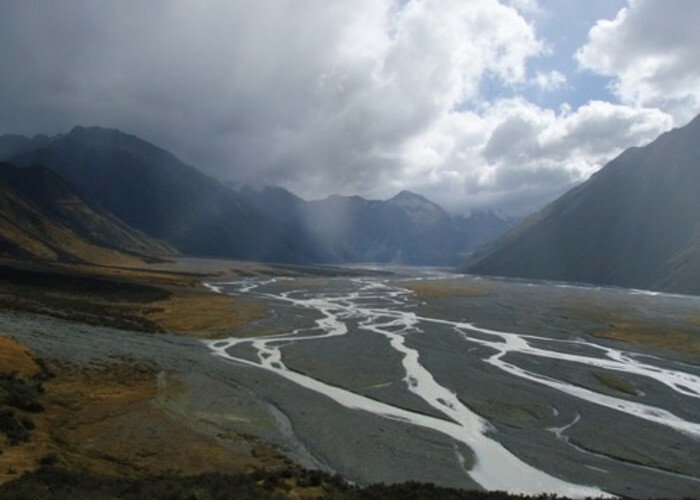 From Neave Hut, follow the now small creek-bed of the Whitcombe and adjacent tussock flats upriver. Going is scrubby at first but soon clears. The valley keeps a steady gradient all the way to the low pass at the Louper Saddle. Upper Whitcombe River at Neave Hut • By madpom. Descent of the Louper is steeper, with one section of waterfalls easily passed on the true left. From the base of the falls it’s an easy walk down the creekbed to the Raikaia. Louper Biv is 1km downriver on flats at the foot of the northern valley face. Those crossing to Reischek are advised to drop to Louper Biv first for a good braided crossing of the river. Whitcombe Pass • By madpom. 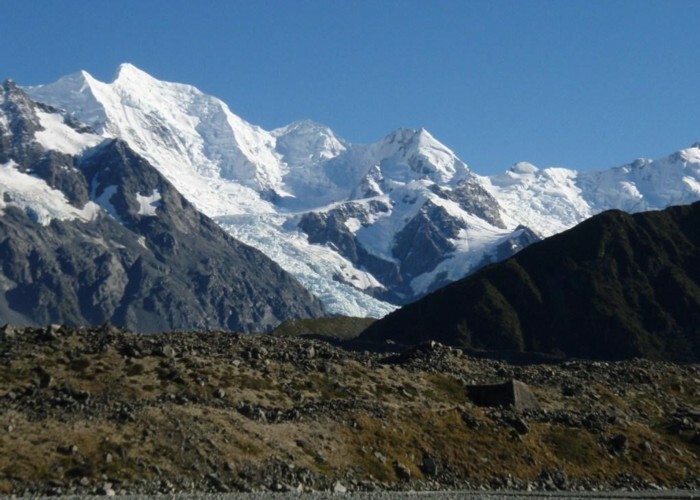 Head directly from Louper Biv towards Reischek Hut across the shingle flats of the Raikaia. A large cairn marks the route. The river briefly braids into 5 channels (2006) at this point, and crossings are tough but reasonable in low-moderate river levels. Higher water levels apparently mean dropping 15k downriver to Erwhon Station to cross, if at all. Raikaia River flats • By madpom. 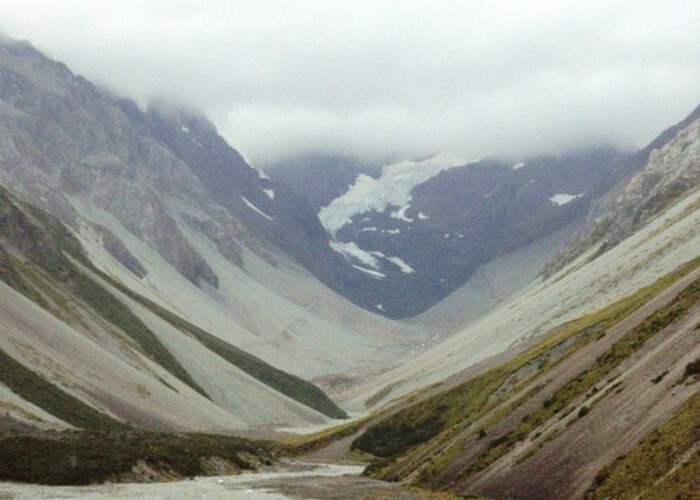 Follow the Raikaia valley floor upriver to the confluence with the Reischek. A flood route exists over the bluff to the east of the confluence if required – but was not needed in low-moderate flows when I visited. Follow the gravel /rock riverbed up the Reischek. Take the true-left branch at the first main forks after about 1km, and the true right at the next fork 1km further upstream. 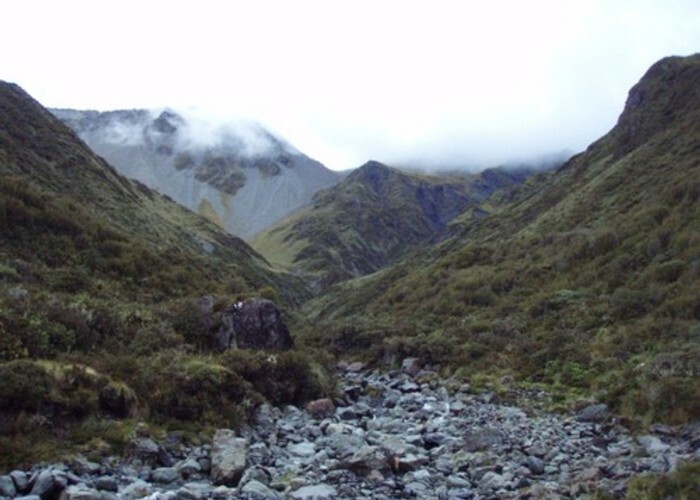 The valley becomes steep by the second fork, and gorges out – some sidling on loose fine scree and tussock is required. 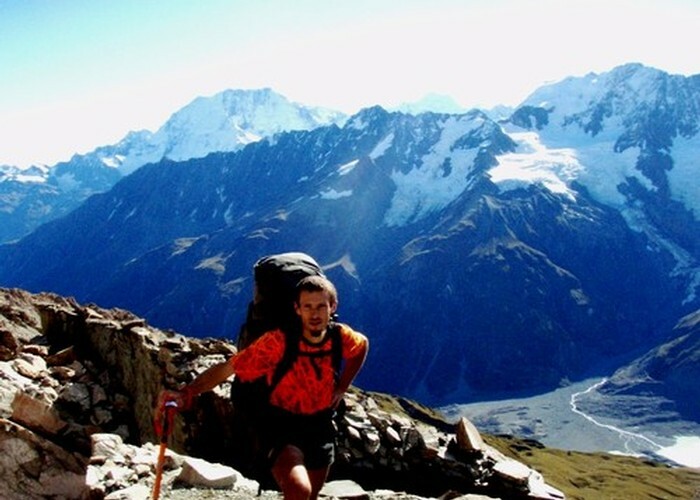 After the second fork, follow the steeply climbing valley to the basin between Butler Saddle and Chambok Col – the true right provides the easiest travel. Avoid the ridge direct to Butler Saddle, which is thick and scrubby. Instead, head up the side of the scree fan to the east of the ridge, leading from the aforementioned basin to Butler Saddle. This is good, solid going except for the last 200m to the pass where scree becomes loose and going tougher. Butler Saddle • By madpom. The descent of Butler Steam is straight forward: surfable scree all the way down to the valley floor, and good gravel creekbed beyond. One gorge exists just before the confluence with the Lawrence, easily sidled on the true left. Butler Saddle and the Lawrence Valley • By madpom. Lawrence Biv sits on grassy flats 1.5km down the Lawrence from Butler Stream – an unmarked but clear track leads there from the start of the grassy flats. Lawrence Biv is a tidy bivvy sleeping 2 on the floor. Water is 50m east, but hard to find in a hidden channel beneath the tussock. You’ll hear it before you see it. No toilet or fire. Lawrence Bivouac • By madpom. Licence: cc by. Follow the gravel / grassy Lawrence River flats downriver, picking up a 4WD track after a while. Upper Lawrence Valley • By madpom. Lawrence Hut can be hard to find – it is incorrectly shown on old 260 series maps, and lies on the north side of the next tongue of beech north of the marked location. The hut is at the back of a grassy terrace on the west of the river, and cannot be seen from the riverbed / track. When you find it, it is a pleasant 6-bunk forestry service hut, with pioneer stove (so no good for cooking), tank water and toilet. Follow the Lawrence over gravel and grassy river flats down to the Clyde. The braided sections above confluence make a possible crossing in low flows, but tricky in anything higher. Follow the Clyde river flats to confluence with the Havelock. Lawrence Valley Flats • By madpom. A 4WD track crosses a braided section of the Havelock 400m upriver from the western side of the Clyde valley, and is the obvious crossing point. Reasonable in low flows, but waist deep, swift and undercut after only 12hrs of rain. A 4wd track leads up the south side of the Havelock passing Growler Hut. Alternative accommodation, if the Havelock can’t be crossed, is Curtis Memorial Hut on the northern bank, further upriver. Havelock Valley • By madpom. The Growler (creek) • By madpom. Follow the good valley floor route up the Growler from the hut. Before the first falls, a sidle route is clearly visible heading diagonally up a scree on the true left. A cairn on the grassy flats marks the start of this route for those descending. A second bouldery section is sidled easily by a rough track on the true right, clearly visible crossing the scree just above the scrubline. The sidle track starts on the terraces at the fork to Balaclava Basin. 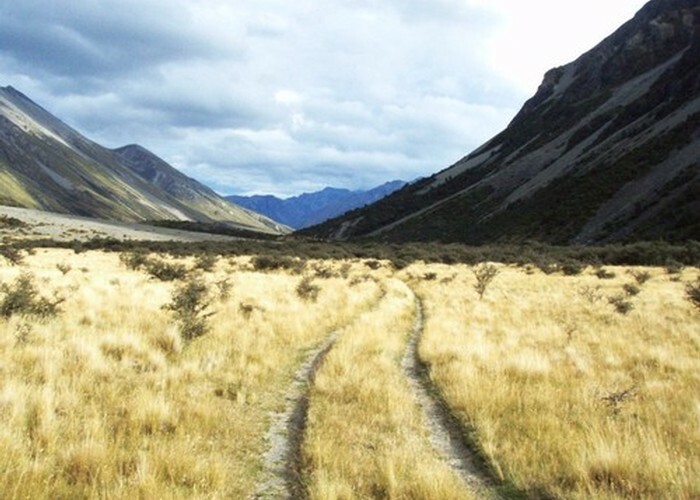 Once the tussock is reached, the ascent to the saddle is good going over grass and tussock. Balaclava Saddle • By madpom. 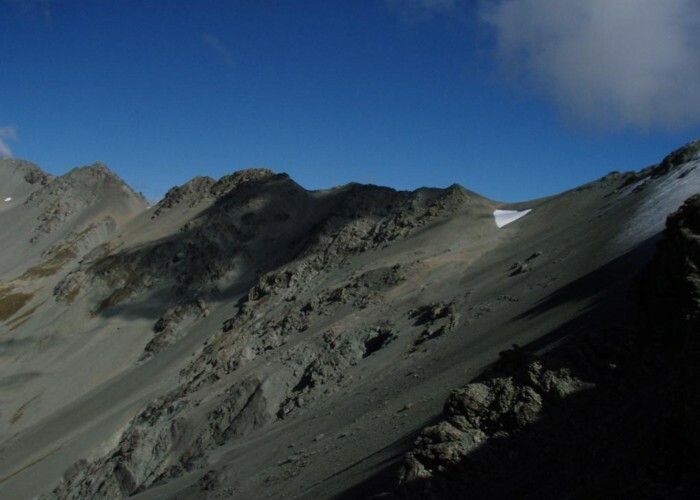 From Balaclava Saddle you need to cut west 1.5km to Plata Col, further along the same ridgeline. Two choices exist: a tough sidle across the scree face below the bluffs, or 500m drop to the valley floor and re-ascent of 600m to Plata Col. Whichever option you take, you’ll need to drop down the scree chutes at Balaclava Saddle to the scree face below, as the ridgeline to the west provides no further options to descend. Plata Col from Balaclava Saddle • By madpom. Licence: cc by. From Plata Col the descent of Tomms Stream is reasonable over scree and riverbed rocks until the waterfall above the lowest forks is reached. On reaching the waterfall, climb animal tracks to the ridgeline on the true left 100m upstream, and descend to the basin below. Sibbald Range • By madpom. MacCaulay Lodge sits just downstream of the confluence of Tomms Stream with the MacCaulay, on the opposite side of the river. The river is only 2-3m wide at this stage, and crossing will not be an issue if you got down Tomms Stream ok! MacCaulay Lodge is a luxurious stone building owned by MkKenzie Alpine Trust, and open to the public. It features lighting, gas, stove, an oven and mountain radio. There’s even a bath, if you can be bothered to build a fire to warm it! Macauley Hut • By madpom. Licence: cc by. Follow the Tindall stream up from the hut. 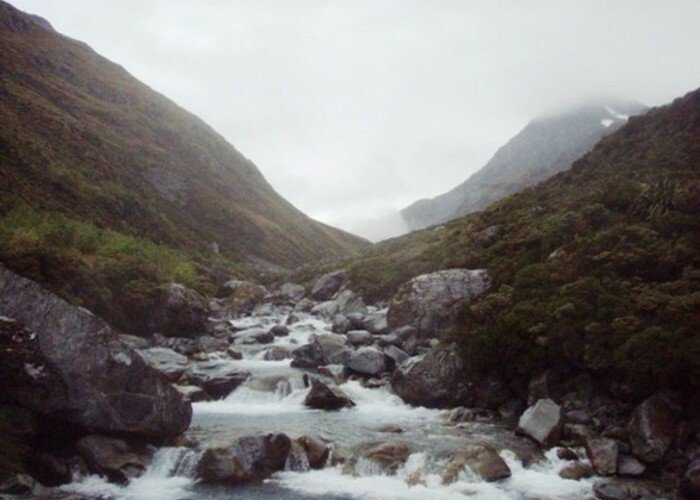 Going is good up the tussock / rock valley floor until a series of waterfalls are encountered. 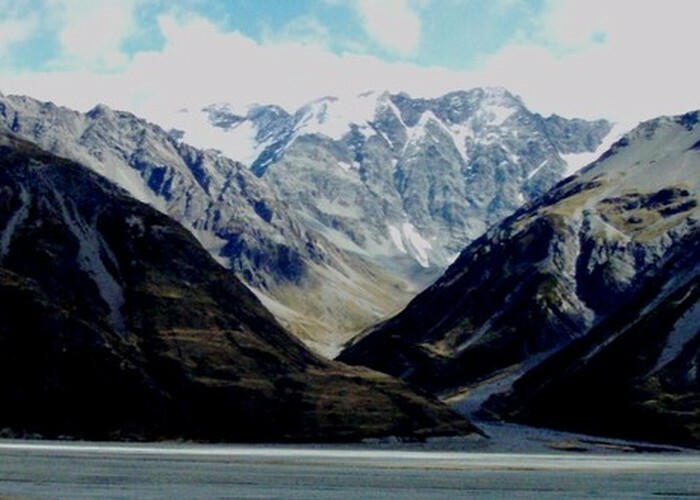 The tussock ridges on the right (true left) provide good access from here to the basin above at the head of the creek and a series of emerald-green tarns. 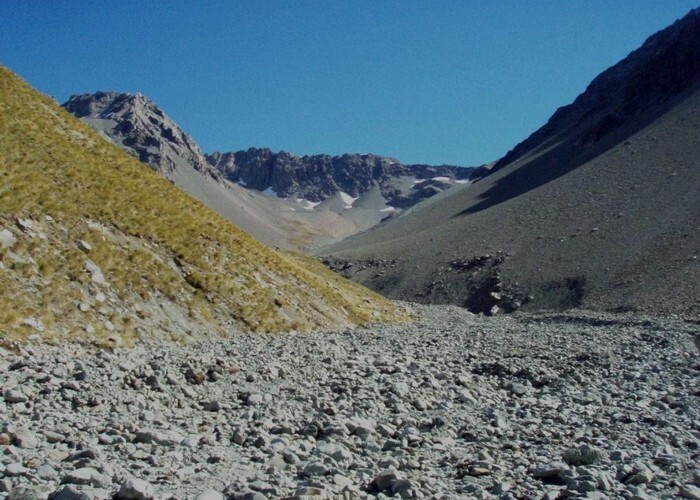 From here it’s a 200m climb to the pass, over first tussock and later good solid scree. The pass provides amazing views of the tarns, the MacCaulay valley, and glaciers all around: Mt Chevalier, and the Sibbald Range. Tarns, Lower Tindall Stream • By madpom. Descend the scree-elevator on the far side, free-running to the valley floor. 2 hours of picking your way downriver through loose rocks and boulders follows on the recently vacated glacial valley floor, to the old terminal moraine. 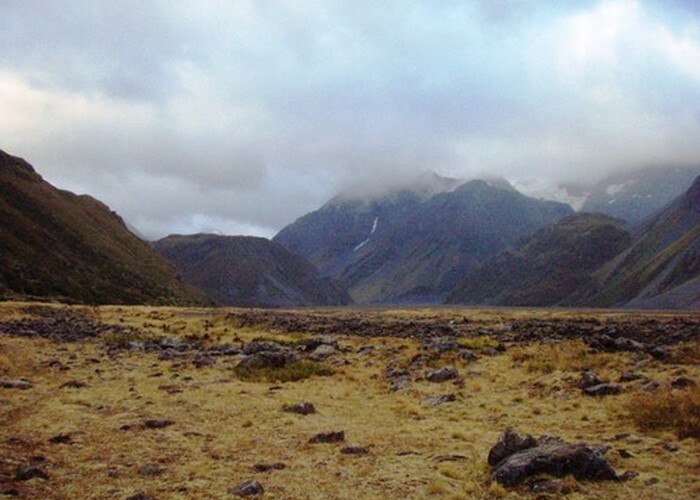 From here going is more stable but steeper, down solid scree and later tussock to the Godley Valley flats. Mount Sibbald • By madpom. 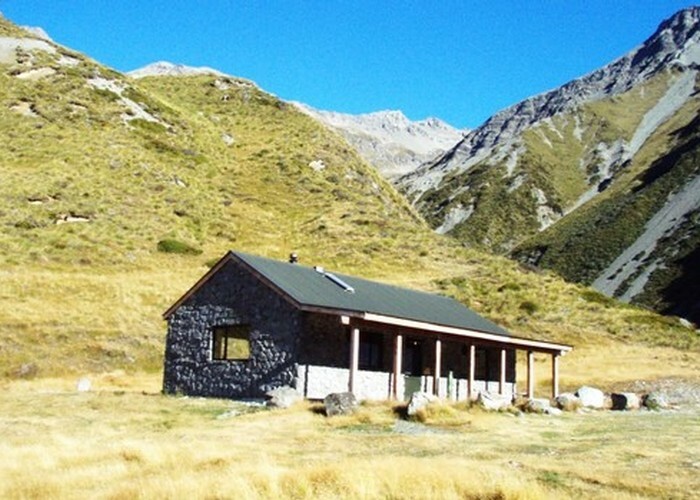 Rankin Hut lies in the shelter of pines, directly across the valley, and is visible from the exit of the creek. Cross the Godley Valley flats – about an hours walk. The Godley river is smaller than the Clyde, Raikaia or Havelock, and was crossable even where in a single channel: moderately fast and waist deep after 3-4 days of intermittent rain in the headwaters. As with all the Canterbury rivers, suspended silt obscured the riverbed and made conditions ambiguous. Godley Valley • By madpom. The six-bunk Rankin Hut is private and can be booked though Godley Station for a fee. Public alternatives are Red Stag Hut on the eastern side, and Eade Memorial Hut on the western bank, both some distance upriver. 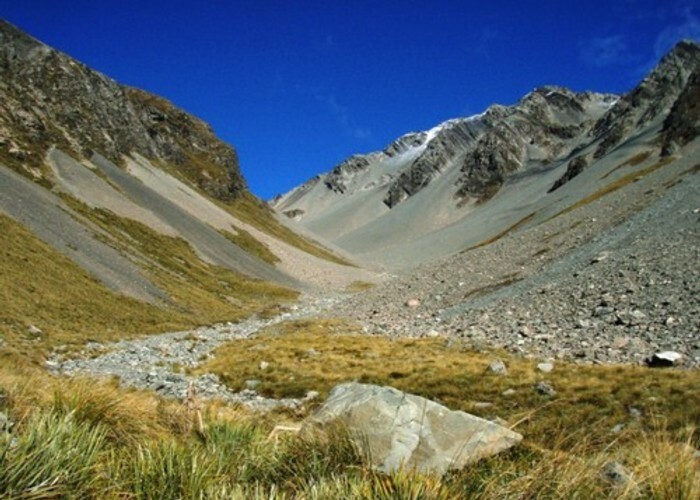 Follow the Rankin valley floor upriver from Rankin Hut to the moraine wall of the lake. Going is easy over scrubby tussock and river gravel. From here the creek ascending to Rankin Pass is clear heading up true right side of the lake, due west, before swinging south towards the pass. The riverbed is navigable but rocky. Easier is the ridge immediately to the east of the creek, due south of the lake. Follow this main ridgeline and cut right to the pass. This ascent provides amazing views of Mt Ronald Adair and the glaciers descending into the Rankin, and also of the circular lake sitting over 100m above the valley floor, retained only by tall moraine walls. 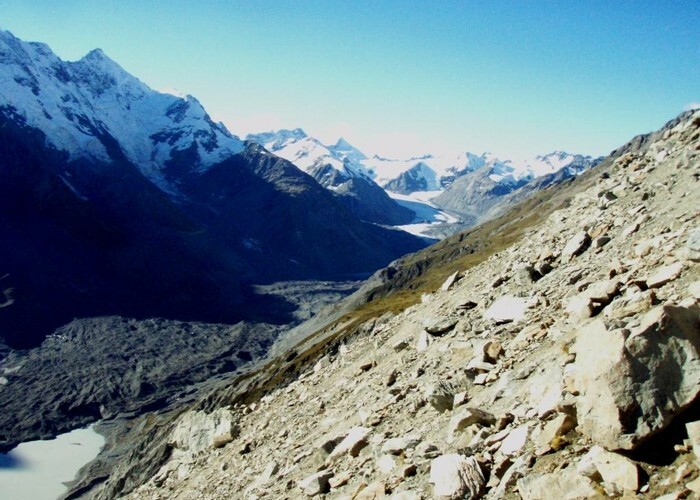 This is nothing, however, compared to the view from the summit down over the Huxley Glacier as it descends from Mt Huxley and runs down the upper reaches of the Cass valley floor. Rankin Stream / Rankin Pass • By madpom. 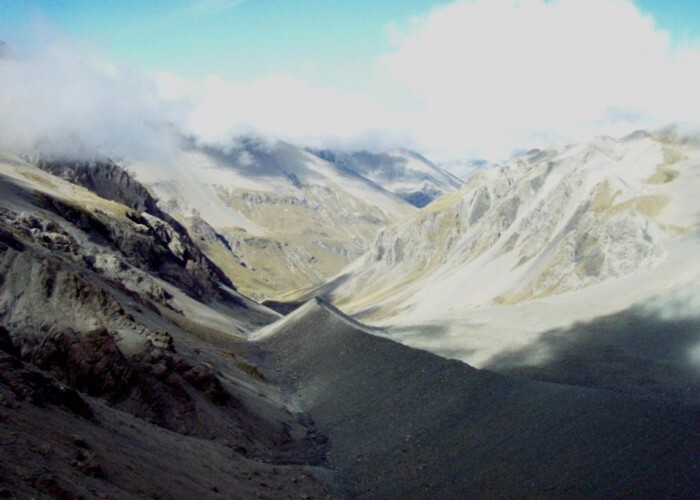 From the Rankin Pass summit, keep to the true right of the stream and descend the series of terraces on that side until the valley floor levels out and becomes navigable. 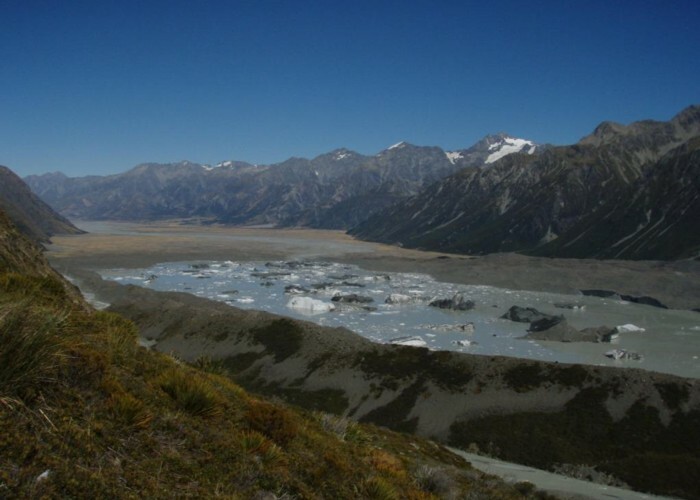 The creek now runs parallel to the Huxley Glacier for some distance, separated only by the lateral moraine wall to the right, with wonderful views from its summit. Cass River, East Branch • By madpom. Licence: cc by. On passing the glacier’s terminal moraine, travel becomes easier, less loose rock and more solid gravel / tussock. Follow the valley floor to the forks between the east and west branches of the Cass. The (private) Memorial and Birdcage huts lie 3km downriver from this fork. Huxley Glacier • By madpom. From the Cass to the Murchinson, two options exist: Ailsa Pass or the Rutherford Pass. The route detailed here crosses the Rutherford from the Cass before sidling and descending ridges below the Ailsa to the Murchinson valley floor. From the forks in the Cass (3km upstream from Memorial / Birdcage huts) head up the west branch of the Cass towards where the spectacular Faraday Glacier (we seem to have a run on physicists here) is visible descending from Mt Hutton. Follow the valley as it swings west past the foot of the Faraday and heads directly for the Rutherford Pass – going is moderately hard over moraine and scree, with a few scrambles required. Cass River and Rutherford Pass • By madpom. Licence: cc by. A steep creek is visible descending on the true left (your right) from the terminal lake of the Low Ridge Glacier. 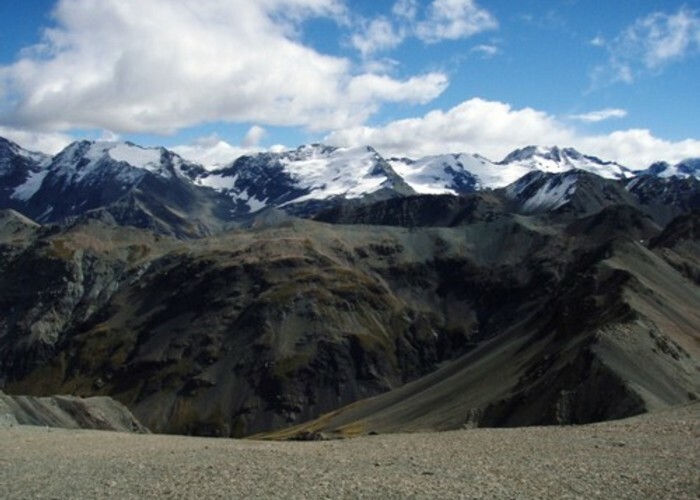 A clear scree ridge runs up to the far side (true right) of this creek to the plateau on which the glacier sits. Ascend this ridge, which is a moderate-difficult scramble up sometimes free-running rocky scree. Cutting to the left of the Low Ridge Glacier on rock or snow as required, it is easy to reach platforms leading west again to a point directly below the Rutherford Pass. From here the route is obvious, but tricky. Use the various scree chutes / scree faces to ascend to the pass, cutting left and right on the intermediate rocky platforms as required to reach good ascent routes. Rock/scree becomes increasingly larger and more stable as you ascend, but is sharp and abrasive stuff to scramble over. Ridge Glacier, Rutherford Pass • By madpom. The view from the pass is almost without equal: the broad post-glacial desert on the Murchinson valley floor with the sheer face of the Malta Brun Range (Brun Ridge Range) beyond, rising to a ridgeline of unbroken ice. Steep, tumbling glaciers descending vertically down numerous gullies and faces towards the Murchinson below. Mt.s Cook, Tasman, Sefton all visible on the skyline. 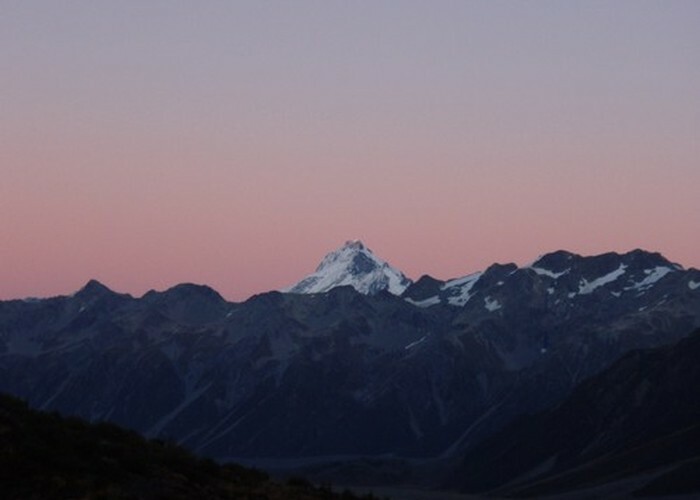 Mt Cook, seen from this close, still towering above the 2270m Rutherford Pass and Malta Brun Range. Ice and rock as far as you can see. 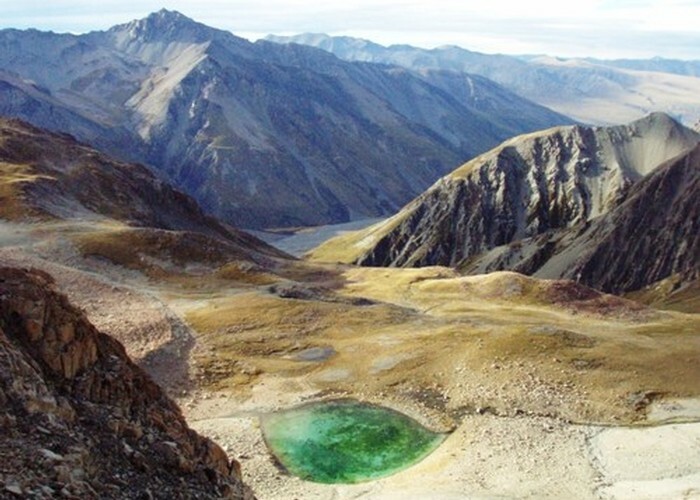 From the 2270m summit of the Rutherford Pass it is necessary to descend into the tussock basin directly below. The initial steps of this can be tricky: from the pass descend to a small terrace some 20m below the summit, where bluffs block your descent. Sidle right, picking your way round huge boulders, for 50-100m until you find a good scree chute leading to the basin below. Though tricky for the first few yards, this can be descended with increasing ease as the gradient lessens towards the valley floor. Following the floor of the hanging valley down it emerges onto a broad, sloping tussock terrace on the main Murchinson valley-side. Continuing to following this valley beyond the terraces leads to sheer bluffs some 700m above the main valley floor, down which no route could be identified. Instead, upon reaching good terraces: sidle left along the true left of the Murchinson, choosing a route to keeping above the highest points of the bluffs but allowing visibility of the creeks and ridges dropping into the valley floor. 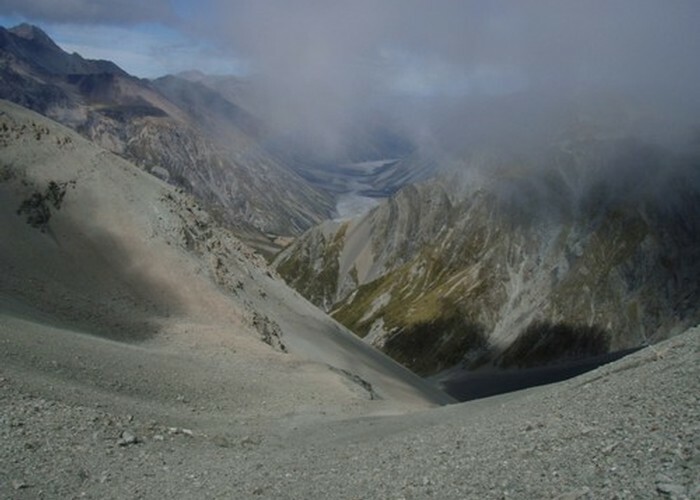 Maintaining your altitude as required, pass three gullies dropping steeply into the Murchinson until you reach the clear, defined ridgeline immediately upriver of the Liebig Hut, and immediately below the marked Ailsa Pass. Murchinson Glacier • By madpom. Licence: cc by. This can be descended easily for about half it’s length to where a clear scree chute (shown on the map) drops off it’s left-hand (western) side to the side-creek above the hut. This chute in hard going – not free-running scree, but finer gravel and soil and makes for a slow, careful descent. 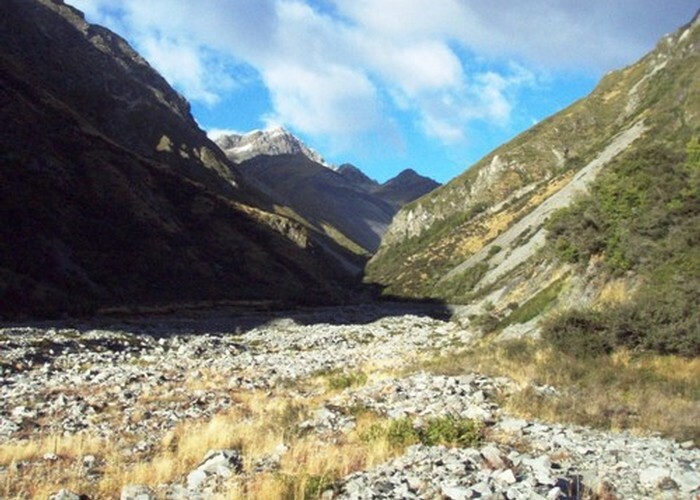 However, from its base it is an easy walk down the creek for the remaining 200m to the Murchinson valley floor. 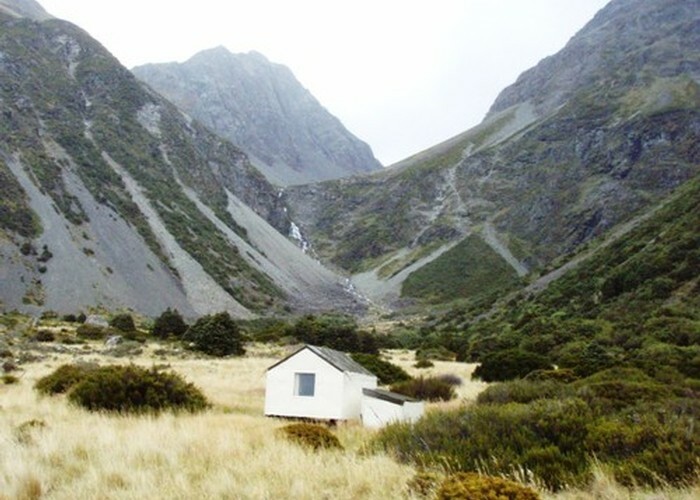 Liebig Hut is about 500m downriver, hidden from view behind the large scree fan. Liebig Hut • By madpom. Licence: cc by. The best route out from Liebig hut is to cross the Murchinson, head down the river flats and follow the lateral moraine down the side of the Tasman glacier and lake until you reach a spot where the glacier boats can collect you. You will need to arrange a pickup in advance. 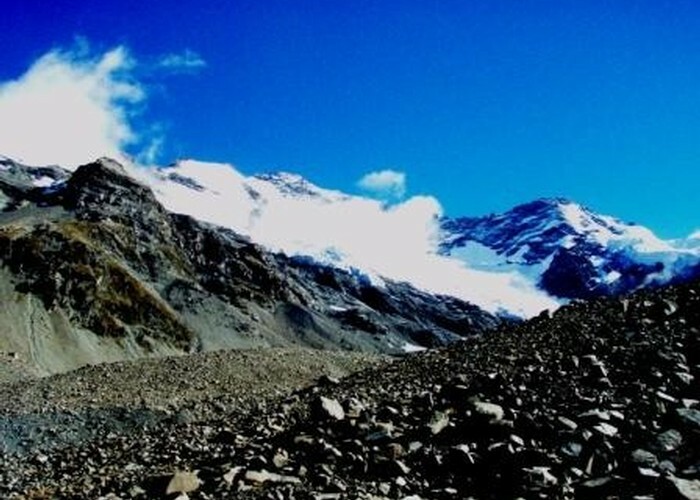 Other parties report crossing the Tasman Glacier to the road, but this clearly requires the requisite skills and experience for glacier travel. 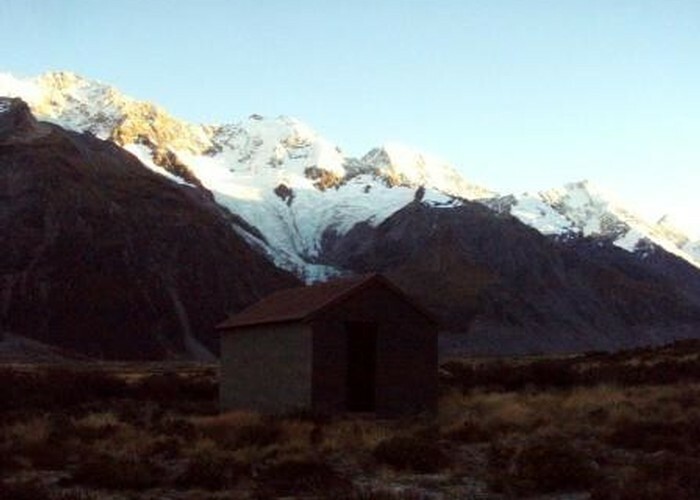 Mt Sefton from Liebig Hut • By madpom. The route documented here is an alternative high-water route sticking to the true left, in case the Murchinson cannot be crossed. It is very hard going, and not recommended unless it is absolutely necessary. 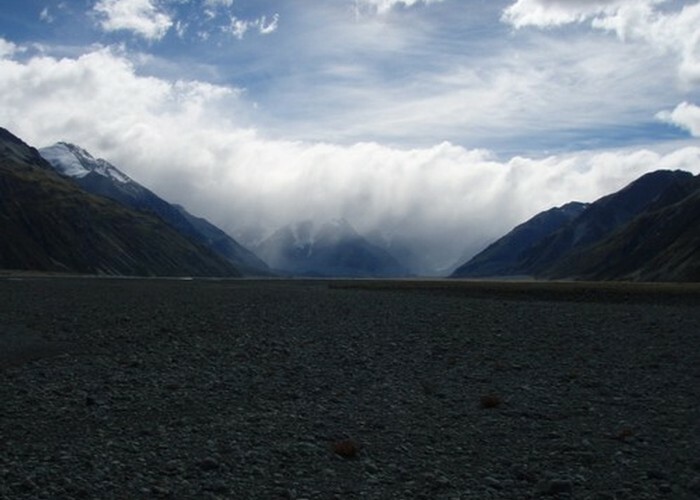 Follow the easy gravel flats to the corner where the river enters the Tasman valley. Bluffs drop almost straight to the river at this stage, but a difficult low scramble is possible, with care. About half way an old system of wire ropes will be encountered which lead to the far side of the bluffs. Tasman Valley from the Murchinson • By madpom. Licence: cc by. 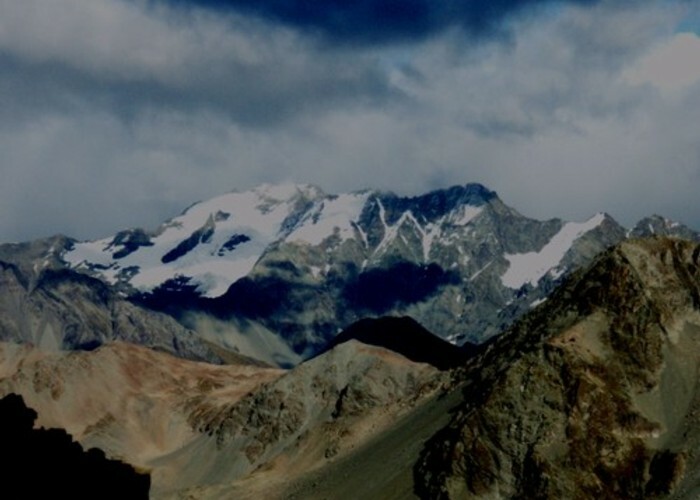 From the far side, follow the valley floor as far as possible, but you will eventually find your way blocked by bluffs, and will need to climb to steep tussock slopes 200m-400m above, and sidle. 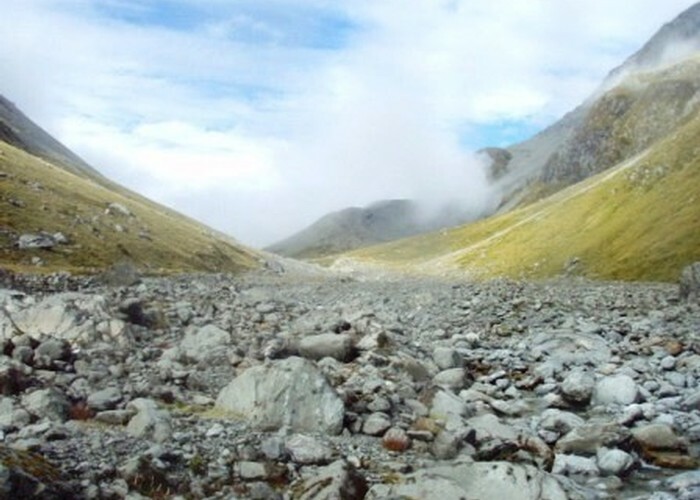 Repeated guts cut through the valleyside, and are mostly impassable – making it necessary to drop right to the valley floor to cross them, and then ascend again. The lower slopes become increasingly scrubby, and dropping through the scrub is difficult, time consuming and tiring. This process is repeated for several km until finally the river flats become passable again 600m from the entrance to the glacier lake. 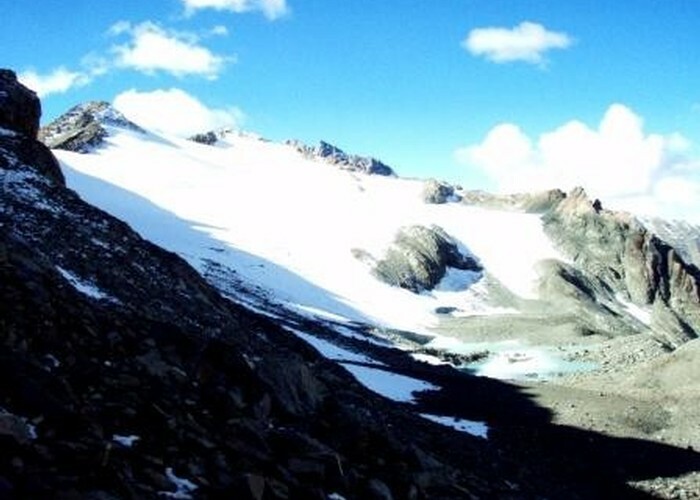 It is worth noting that marginal mobile phone coverage is possible in the higher slopes as you near the lake, and it may be possible to contact the glacier boats to confirm your pickup time from here. However, the signal was very weak, and I wouldn’t want to rely on it. Tasman Glacier lake • By madpom. Licence: cc by. A final band of scrub forces another scramble from the valley floor for the last 100m to the lake. Finally the rocky debris of the moraine wall which retains the lake is reached. Hopefully you’ve arranged for the boat to pick you up here, otherwise it’s a long walk down Lake Pukaki to Twizel! Added 3 February 2011 by madpommadpom. 8 revisions, most recently 11 February 2011 by madpommadpom.